Choose the Receive Customer Payment command. Display the Business tab, click the Business Actions button, and choose the Invoices and Estimates→Receive Customer Payment command. Quicken displays the Payment window. Open the Customer box and select the customer for whom you want to record a payment. After you select the customer and move to the next box, Quicken displays a list of any unpaid invoices the customer owes. You should enter the payment amount into the Amount box. You should probably also record the payment date using the Date box and the customer’s check number using the Check Number box. Select the bank account into which you’ll deposit the check. This is easy. Open the Deposit To drop-down list box and select the bank account. Identify the open invoices the customer is paying. Quicken attempts to guess at which unpaid invoices the customer is paying, marking the invoices with a check. Often Quicken guesses correctly, but verify that the correct invoice shows a check mark. You can select and deselect invoices by clicking the check mark. If a payment pays partial amounts of unpaid invoices, you can click the Payment column in the Outstanding Invoices list and then edit the amount. After you describe the payment and apply it to the correct open invoices, click the Enter button. 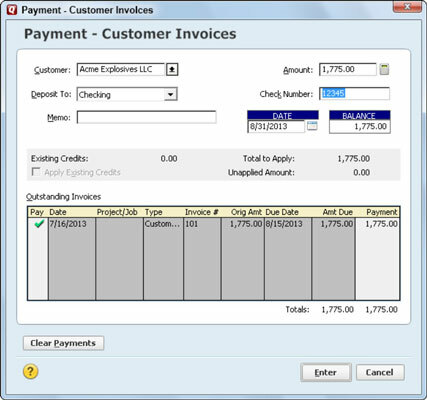 Quicken records the payment and updates the invoice open balance(s).